Help Us Fight Cancer -- NOW: The Tour de France...and bee stings to the FACE. The Tour de France...and bee stings to the FACE. THIS COULD SAVE SOMEONE U LOVE. ...you can also have members of the LiveStrong team chalk your message onto a road on the race course over the next three weeks...and once the location has been established, they'll let you know when and where it was placed. 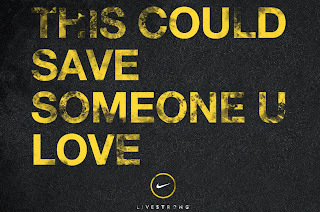 If you have a moment, check out the Nike site that is dedicated to LiveStrong. You'll find updates on the Tour de France, messages others have sent, and videos of individuals who have, or are currently, battling cancer. All of this is inspirational, isn't it? The more I think about the monumental battles that cancer victims -- young and old -- are facing every day while we go busily about our "normal" lives, the more I'm driven to let go of the small, daily annoyances in order to focus on bigger issues, and possible grand solutions. On my bike ride Saturday I ran ideas through my mind for fundraising for the upcoming Pelotonia -- wondering if I could possibly reach my required goal of $1500, while at the same time wondering how much MORE I could raise than the minimum required by the organization. I also started thinking about my NEXT ride and my next course of action, for helping those who are facing down issues far more serious than anything life has ever forced me to contemplate. There's no doubt about it -- I've been blessed. All my grand daydreaming came to an end, however, when a bee slammed into my right eyebrow -- stinger first -- about 20 miles into my ride. O-U-C-H. I almost lost control of the bike and crashed (at 25mph, no less), but someone was looking out for me, I do believe. Did any of you hear the language I used for the few painful moments after pulling the still-buzzing bee from my forehead? NOT PRETTY! I think it was a sign. Focus on THIS ride for now, Jeff.